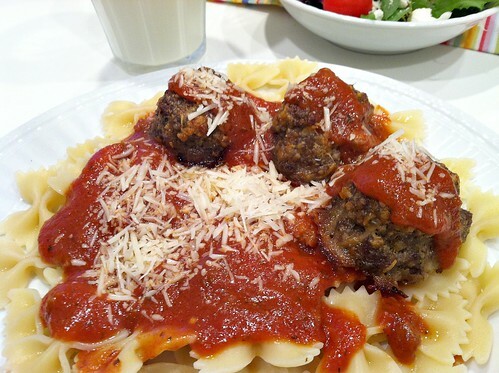 As many of you have probably noticed… pasta is one of my favorite comfort foods. It also happens to be an extremely simple and frugal meal to prepare — both of which work in my favor. And thankfully, Dave and Nora share my love of pasta. In fact, when Nora is asked what she’d like to eat, 9 times out of 10, she’ll say “pasta”. Pasta ALWAYS sounds good to me! I realize pasta is not the absolute worst or most unhealthy food choice I could make; however I also know it doesn’t have many nutrients at all. 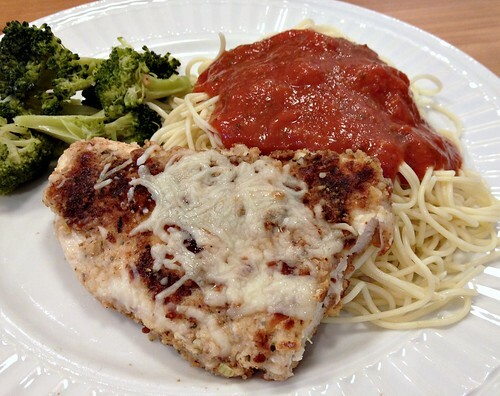 I usually serve our pasta meals with at least one cooked vegetable, a salad, and my homemade applesauce — so the meal isn’t all starch 🙂 And sometimes, I’ll serve the pasta as a side dish to chicken parmesan, homemade meatballs, or another meat of choice for a more hearty meal. Due to all the gluten-free diets popping up these days, my pasta recipe posts are frequently met with “how can I make this gluten free?” questions. I suppose my obvious answer would be to simply substitute gluten-free pasta. However, I’ve recently been hearing a lot about Spaghetti Squash from people in my “circle”. 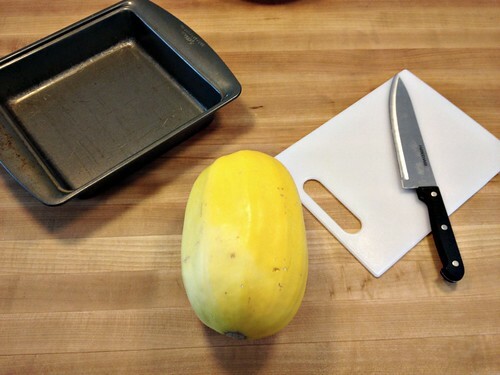 Even my sister (who also loves pasta) reported that she has regularly been swapping out many of her noodles for spaghetti squash as it’s so much healthier and actually contains vitamins and nutrients! Since squash is gluten-free, I figured I had to give it a try, not only to appease my many gluten-free blog readers, but also just to satisfy my own curiosity as I was not very optimistic it would taste great. I only did one squash for this post — but if this is something you want to eat more often, I’d suggest baking several squash at the same time. 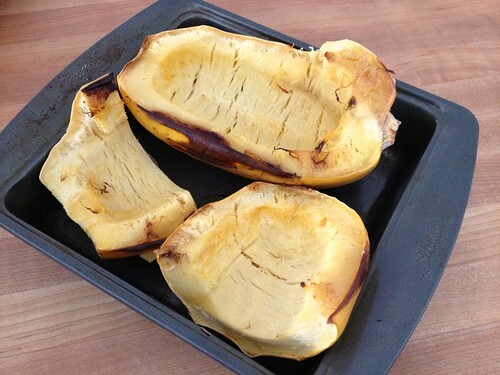 Preheat oven to 350*F. Grease whatever pan(s) you’re using to bake the squash. 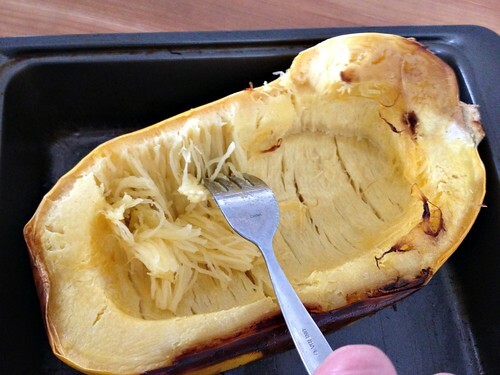 Cut each squash in half and scoop out the seeds with a spoon. Please the squash, cut side down, in the greased pan and bake for 90 minutes at 350*F.
After the squash is cooled, use a fork to “shred” it into pasta-like strands. This is extremely simple and will require almost no pressure as it literally just falls apart. I shred mine over a bowl and then cover and refrigerate until I need to use it for a recipe (usually later that day or the next day). At this point, you can essentially use the shredded spaghetti squash in place of spaghetti noodles in any of your favorite pasta recipe. 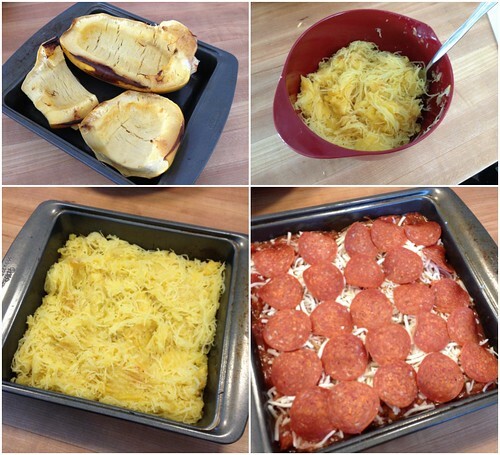 The picture below is of my Pizza Pasta (one of our favorites) made with spaghetti squash. Dave and I were both extremely surprised by how good it tasted, as well as how similar the texture was to regular pasta. We both had seconds and eagerly heated the rest up for leftovers the next day. Nora immediately noticed a difference and asked, “Why did you use different ‘basketti’?” I just told her it was a special kind of spaghetti, and that seemed to work for her. She ate almost everything we gave her — which means she ate a fair amount of squash! I’m certain I won’t use spaghetti squash as a pasta substitute every single time — but this seems to be a really great way to incorporate more veggies and nutrients into pasta meals that might otherwise be a bit lacking in nutritional properties. Oh yeah, and it should work for all of your gluten-free needs! What are your favorite healthier recipe substitutes? I just cooked a butternut squash this weekend in the slow cooker like you said in your past post and made the creamy butternut squash soup. It was so delicious and easy so I plan to do it more during the winter. I can cook the spaghetti in the slow cooker too, right? 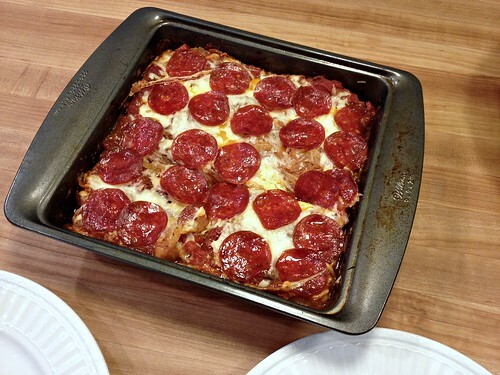 I want to try this spaghetti pizza next. I know — it’s SO good. I could (and often do) just eat the squash right out of the skins! I microwave my squash as well. I cut it in half, leave the seeds in, poke a few holes through each half. I place it cut side down in a glass baking dish with a bit of water for about 12-15 minutes. This steams the squash pretty well. I like the steamed texture better than baking. Of course after cooking it still needs to cool down, but it’s better than waiting over an hour for squash to cook in my opinion. Glad you tried it! If you got your daughter to eat it maybe my husband will give it another go. We also love spaghetti squash. I cook mine in a crockpot. It is by far my favorite way to fix it. You just poke a few holes in it and cook on low(or high if in a hurry) for a few hours or as long as it takes to become tender. 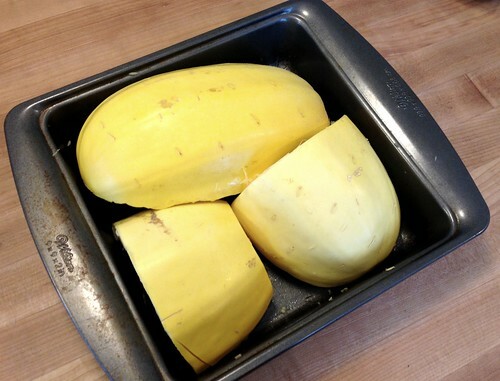 We grow spaghetti squash in our garden and they keep well on our kitchen counter for several months. What perfect timing! I have been looking this past week at spaghetti squash recipes to figure out what to do with the one I just bought. Now, I know exactly what I am going to make! Thank you Andrea. Thanks for posting this, and especially for all the pictures! I’ve always wondered how cooking a spaghetti squash works. I tried some as a side dish once at a restaurant and was not a fan, but good to know it can make for a good substitute in a casserole-type dish! It’s also really good if you mix the squash and actual spaghetti together. We usually do about 1/2 & 1/2. 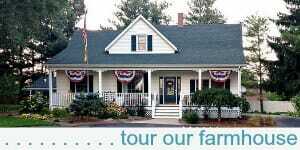 That way you still get some of the traditional yumminess and more nutrients. My 2 1/2 yr old doesn’t even notice half her ‘basketi” has been replaced once the sauce and cheese is on there. I thought about doing 1/2 and 1/2 too — next time! We have been eating gluten free a long time so this is an old friend. I don’t bake it though. I simply microwave the cut halves for about 15 min. If it’s particularly large I cut each half one more to make 4 long narrow wedges. I remove seeds once it is finished. Also since it is hotter than blazes when you first take it out of the oven or microwave, I find wearing my dishwashing gloves helps. If that grosses anyone out please let me tell you I only use these gloves to wash my handwash-only pots and pans, knives etc. I don’t clean with them. 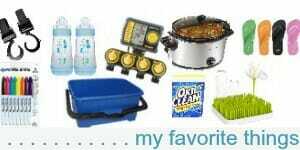 I like really hot water for washing so I always use my Mr. Clean white gloves. Anyway they help protect against the heat. Another pasta sub is zucchini noodles. I got a cheap little noodle maker from Amazon. My only recommendation is that once the zoodles are made you must pat dry and sauté lightly in some olive oil, since a ton of water comes out of them. You can also use it as a low carb sub in potato casserole. Just cover it in cheese. My husband is pretty picky but he will eat it if I cover it in cheese. I myself starting using some spaghetti squash. You are right in the fact that it will never be pasta, but I love the ability to try something new and add a little more veggies in the diet department. The little one ate it right up though! 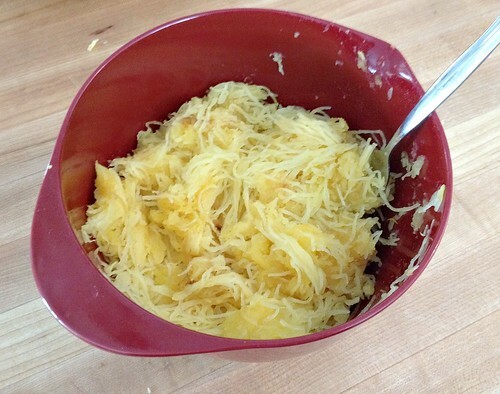 My family eats “spaghetti” once a week, and several months ago I switched to using spaghetti squash instead of pasta. We all like it even better than pasta. My daughter heard a great name for it–“impasta.” I wanted to pass along a quick-cooking tip: use the microwave. 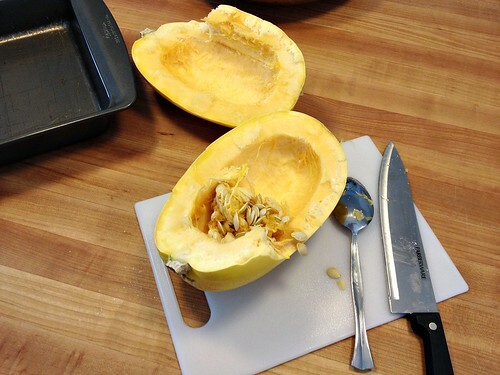 If you have a medium-size squash, poke a few holes in it with a sharp knife (so it doesn’t explode), then microwave it for somewhere between 7 and 9 minutes, depending on how tender you like the squash (you may have to experiment with this for a few squashes to learn just how you like it cooked). This cooking speed makes it entirely doable for a quick dinner with no planning ahead. I highly recommend it! and thanks for the quick-cooking tip! 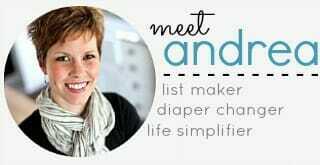 So glad you posted this, I just got one to try this and my sister in law said she likes it as shrimp ‘scampi.” I didn’t realize it could be made ahead, thanks for the tip! shrimp scampi sounds amazing! Dave doesn’t like shrimp so I never make that… but yum!